Finding the perfect Toyota to suit your needs is simple and affordable with our Motability scheme. Explore the information below to know more. The Motability scheme has been designed to help disabled people, members of the Armed Forces and war pensioners lease a brand new car as part of their Mobility allowance, funded by the government. The Motability scheme comes with a wide of benefits, including fully comprehensive insurance from RSA Motability (RSAM) with up to two named drivers, servicing, maintenance and repair costs covered, complimentary complete RAC breakdown cover, free tyres and windscreen replacement, 60,000 mileage allowance over 3 years and a chance to lease a brand new car after 3 years. You may be entitled to join the Motability scheme if you receive any of the following government-funded allowances (with at least 12 months’ award length remaining): Higher Rate Mobility Component of Disability Living Allowance (HRMC DLA), Enhanced Rate of the Mobility Component of Personal Independence Payment (ERMC PIP), War Pensioners’ Mobility Supplement (WPMS) and Armed Forces Independence Payment (AFIP). To find out whether you are eligible for the Motability scheme, please use the eligibility checker. 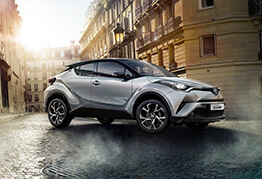 At Toyota, the majority of our Motability cars are available with £0 advance payment, saving you money in the long-term. As most of the costs of running a car are covered by the scheme, you only need to think about your fuel bill. In fact, some vehicles in our range may cost less than your allowance. Explore our extensive list of Motability offers to suit your budget or check out our pricelist for further financial information. Autoadapt is a world-class manufacturer in mobility car adaptations, recognised by the Motability charity and European Mobility Group. For over 20 years, Autoadapt's mission has been to offer safe, functional and well-designed solutions for disabled and less able people. ELAP Engineering is a well-established company providing car adaptation solutions, including its patented rotating car seat concept. Their services have been designed to suit your mobility needs to help you on your way towards independent driving. To find out more information, please contact our dedicated sales team who are equipped to help answers your questions about auto adaptation. Alternatively, please visit the ELAP‘s website to learn more about their full range of services.